Have you ever imagined taking temperature readings of your body or that of your child devoid of the hassle of placing the equipment in the armpit? Well, Metene has just narrowed your choices to this NON-CONTACT thermometer that stands out with its high scores that you deserve. Using the infra-red technology with a robust chip design, the device achieves highly accurate and fast readings from a one-time scan making it simpler for medics and even parents to use. It is no wonder that the Metene Digital thermometer is *CE and FDA approved since it it trustworthy and has earned the accolades of professionals. -The outstanding Metene thermometer boasts of taking accurate reading. -The thermometer has exceptionally fast testing speed. -With a beautiful LCD light, the temperatures can be comfortably read in the dark. -By a simple button press there is no more hassle involved while changing between Celsius and Fahrenheit. -Metene is a NON-CONTACT thermometer making work extremely easy for medics. -It comes at a competitively affordable price. More details for the measurement ,please Read the directions carefully. Please wait for more than 30 minutes after the thermometer is moved into the measurement environment. What's more,there will likely be a normal error range and the accuracy range is ±0.3℃(±0.6℉). 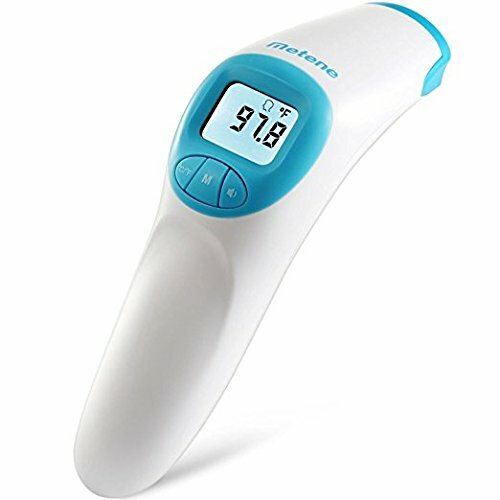 Higher Accurate Reading:Enjoy Hospital Grade Accuracy at your home, clinic or workplace in confidence due to the thoroughly tested reliable of your health care thermometer.Its shape, choice of colors and its amazingly light weight speaks of artistic genius and first class design capabilities. If you have any questions about this product by Metene, contact us by completing and submitting the form below. If you are looking for a specif part number, please include it with your message.